It really sounds good, so I want to share my opinion about this program, that I agreed just today. 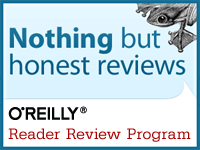 O’Reilly offers free e-books copy to people owning a blog that wants to review the copy received with a post on his blog. You can read the book and share your opinion to the world. I asked to receive this book. For whom it may concern, this is the link to agree to the program.